The Gallery in Android 4.2.2 Jelly Bean retains its ICS looks and functionality. The Default view of the gallery is Albums, the first of which is always the Camera album, which has a camera overlay icon too. Rather than the familiar stacks, the app uses a grid of photos, two on a line. Anyway, the single photo view is updated too - above the photo are several sharing shortcuts and a delete button, while the underlying line of small thumbnails of all other photos in the album isn't present any more. The video player has retained its stock Android interface. 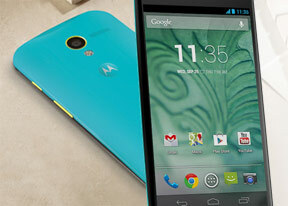 Motorola however, have added much better codec support than the one found in Nexus devices. The video player is now perfectly usable out of the box - it plays a host of formats which include H.263, H.264, MPEG4, VC-1, VP8 in up to 1080p resolution. You can also wirelessly sharing videos with a Wi-Fi enabled TV. The feature relies on the good ol' DLNA technology to connect and the Miracast protocol for streaming. It's another feature most customs launchers had, but is only now making its way to the platform itself. Google's own music player called Play Music is on board the Moto X. It went through a major UI overhaul and is now snappier and more beautiful. It features the spanking New Listen Now feature which tries to determine what you like and the sequence of your track-changing so that it can start offering you music you might like to play next. 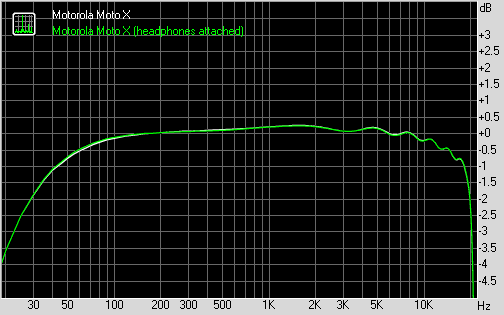 The Motorola Moto X did quite well in our audio test, demonstrating output worthy of a flagship. When connected to an active external amplifier the smartphone showed great dynamic range, signal-to-noise ratio and stereo crosstalk. Its frequency response could be better in the lowest and highest frequencies but was close to perfect for the rest of the range, and while the intermodulation distortion was slightly high, harmonic distortion was absent. The great news is, besides some extra stereo crosstalk, there's virtually no degradation when you plug in a pair of headphones. And with the volume levels pretty high in both tests, the Moto X earned an excellent mark here.